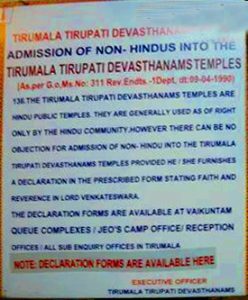 Detailed description on Infant Entry and NRI Timings in Tirumala Darshan. Infant i.e children up to 1 year have special entrance via Supadam Entrance. Through Supadam Infant and His parents, siblings (below 12 years of age) are allowed. Infant and His/Her Parents are allowed right from 12 pm – 6 pm, will be allowed for special entrance thru Supadam. It is always advisable to carry Age proof like Birth Certificate for Infant if Infant is close to an year. Sometimes Staff may demand for age proof at the Queue Entrance. Infant and Parents are allowed right from 8 am thru 1:30 pm but not during Seva Tickets Darshan Timings. Senior citizens do have special entry via Supatham/ Supadham Entrance. Age proof is required to avail this benefit. 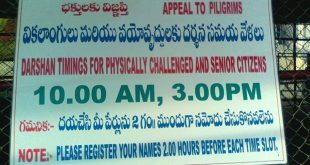 Senior Citizens are allowed for Darshan at two schedules i.e 10 A.M and 3 P.M.
Physically Challenged do have special Entrance in Tirumala Via Supatham for Darshan. 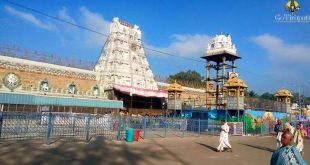 Physically Challenged devotees are allowed for Darshan in two schedules i.e 10 A.M and 3 P.M.
NRI (NonResident Indians) do have entry via Supatham / Supadham entrance. One need to carry passport and visa. And the timings are every morning in 12:00 p.m onwards up to evening 6:00pm they can go to this entrance. 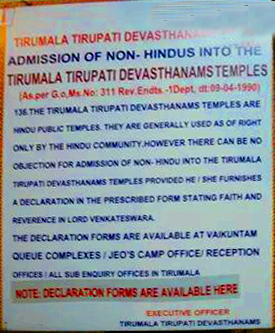 1) Ticket is not required for children below 12 years in Tirumala for Darshan, they can accompany with their parents.Photo copy of birth Certificate with ID proof of parents is required. 3) Supatham entry cost Rs.300 per person, which to be paid at the Supadam Entrance. 4) NRIs (Non Resident Indians) who holds POI (Person of Indian Origin) can access Supadam by carrying POI Card and Foreign passport. We are family of four 2 adults and children 13 and 2 years old planning Darshan on 17th Jan. we all hold British passports but my family came to India on 3/12/2018 and I arrived to India on 23/12/2018. Are we eligible to use NRI pathway for Dharshan? How long does it take from entrance to Dharshan? What are the NRI timings please? 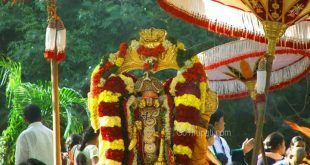 Do have car park facility near temple? No it should be less than 30 days of arrival to India for using NRI darshan. You need to get the tickets at supadam entrance, only NRIs are allowed, there is no such privilege in accommodation for NRIS. Dear sir. Infant darshan gents were color pant sir? Yes you can wear but be in a traditional attire . Tomorrow onwards NRI counter closed for 2 following days,? Yes on radha sapthami date no privilege darshans are entertained .